1. The index must be able to be replicated. 2. In the case of ETFs, any disconnect between the price of the passive vehicle and the market value of an actual basket of securities should be able to be easily arbitraged. 3. Fees on the passive vehicle should be low. Ultimately, the fee is the guaranteed underperformance of the passive vehicle compared to the benchmark. High yield is an asset class that does not lend itself to passive investing easily, given that it lacks the three characteristics mentioned above. 1. It is nearly impossible to replicate high yield benchmarks. Rather than 500 publicly traded stocks, the bond benchmarks consist of 1800 over-the-counter traded debt instruments. The largest size security in the BofA Merrill Lynch High Yield Cash Pay Index is $5.2 billion and the smallest is $250 million1. Only the largest and most recently issued bonds are traded often. Therefore, passive strategies are limited to duplicating an index that is only a subset of the more comprehensive benchmarks and many issues in the subset have tended to be the more volatile, higher beta securities. In the case of iShares iBoxx $ High Yield Corporate Bond ETF (HYG; the largest passive vehicle), the ETF replicates only 52% of the total number of bonds in the BofA Merrill High Yield Cash Pay Index and it represent only 68% of the benchmark’s market value2. 2. Differences between the price where high yield ETFs trade and the market value of the basket of bonds held in the ETF (the NAV) are not easily arbitraged. Bonds may not be available for purchase and there may be substantial bid/ask spreads as the ETF is required to buy or sell bonds in response to contributions or withdrawals. Therefore, ETFs may trade at a premium or discount to the NAV for relatively long periods of time because it is not profitable to arbitrage the difference. (The chart below illustrate the premium/discount of HYG since 2008). As the market for high yield ETFs matured, the price premium/discount to NAV narrowed. While the largest discounts have been experienced during quarters when the benchmarks are down more than 1%, HYG has traded at a premium to NAV 85% of the days since 2008. 3. Passive investing in less liquid sectors, like high yield, is not as competitive as other asset classes because the demand for passive high yield strategies is not as large and requires considerable resources. A manager needs to have a knowledgeable team with expertise to trade in the over-the-counter market. Consequently, fees for high yield ETFs are 40 to 50 basis points, not substantially less than actively managed high yield mutual funds. In the end, investors have tended to focus primarily on performance results in evaluating active versus passive investing options. In the case of high yield, the passive vehicles have not been able to outperform either the overall benchmark or the median active manager over longer periods of time. Past performance is not indicative of future results. Data shown above is annualized. The performance data quoted represents past performance and current returns may be lower or higher. Total return figures include change in share price, reinvestment of dividends and capital gains. The investment return and principal value will fluctuate so that an investor’s shares, when redeemed, may be worth more or less than the original cost. HYG is the ticker symbol for the iShares iBoxx $ High Yield Corporate Bond ETF. JNK is the ticker symbol for the SPDR® Bloomberg Barclays High Yield Bond ETF. 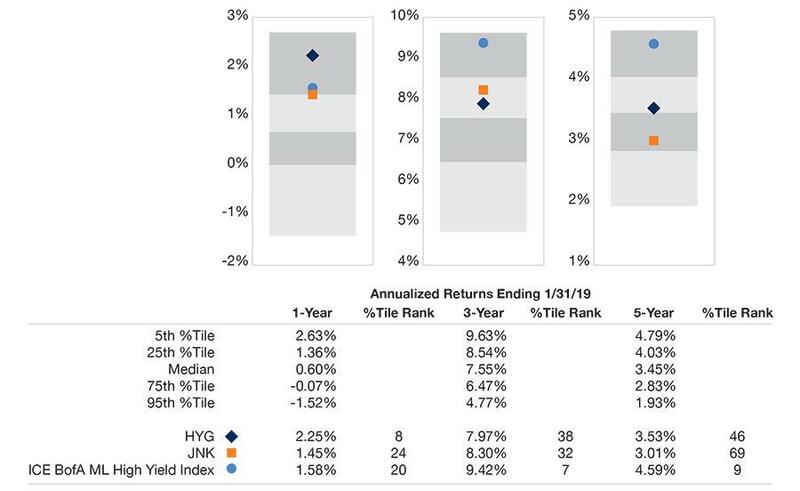 Over the five-year period ended 1/31/19, the returns of the two largest high yield ETFs, HYG and JNK, were below 46% and 69% of active managers, respectively. Also indicating the inability to replicate the standard benchmarks, the BofA Merrill Lynch High Yield Cash Pay Index has been in at least the top 9% of active managers over all time periods. Given the challenges with replicating the high yield index and the historical underperformance of high yield passive strategies, investors have ample reason to consider active management over passive in the high yield sector. S&P 500® Index is a free-float market capitalization-weighted index of 500 of the largest U.S. companies. The index is calculated on a total return basis with dividends reinvested. The indexes are unmanaged, their returns do not reflect any fees, expenses, or sales charges, and are not available for direct investment. A Basis Point (bp) is equal to 0.01%. Average Coupon is the weighted average coupon (annual rate of interest on the bond’s face value that the issuer agrees to pay the holder until maturity) of all the securities in a fund. BofA Merrill Lynch High Yield Cash Pay Index is an unmanaged index consisting of all domestic and Yankee high-yield bonds maturing over one year. The quality range is less than BBB-/Baa3 but not in default (DDD1 or less). The index does not reflect the deduction of expenses associated with a mutual fund, such as investment management and fund accounting fees.